1 pair of medium gloves in lilac. 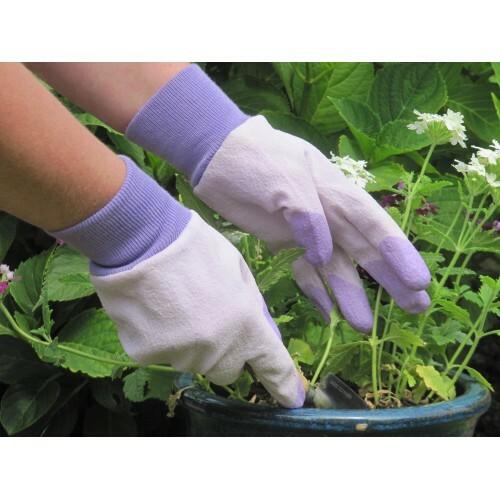 The Tough Tips Gloves by Gold Leaf are possibly the best gardening gloves you'll ever own. Endorsed by the Royal Horticultural Society. They are fully coated with a breathable synthetic coating, with a thicker coating on the finger tips. This will give your hands far more protection than normal gloves which aren't fully coated. Available in Pink (small), Lilac (medium) and Grey (large). MicroFinish ultimate coating technology promises unparalleled grip performance. A soft yet dur..